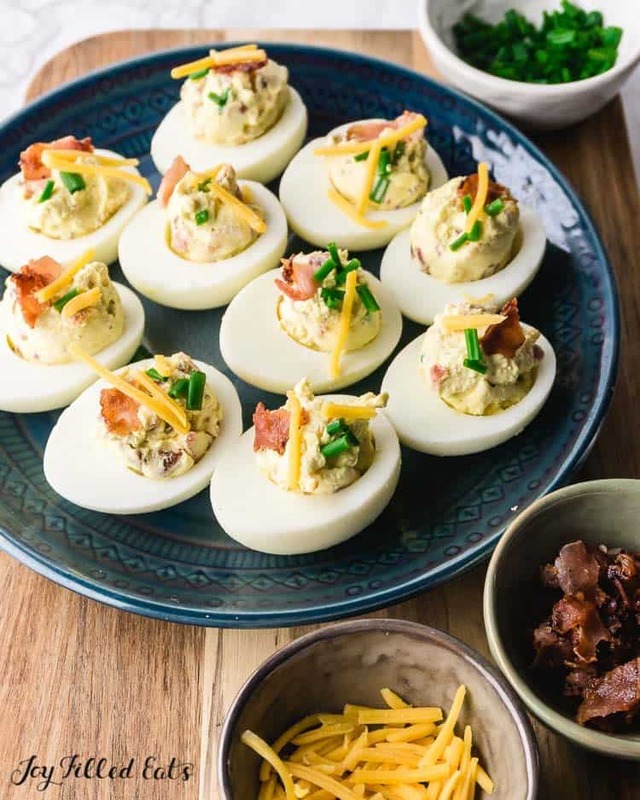 These delicious keto deviled eggs with bacon have a creamy and velvety sour cream filling, with savory cheddar cheese, crunchy bacon, and fresh chives. If you need a quick low carb appetizer to bring to a holiday party, or an easy recipe to pack in your lunch, this is a recipe you’ll definitely want to try. I love taking classic dishes like Deviled Eggs and giving them a fun twist with new flavors. 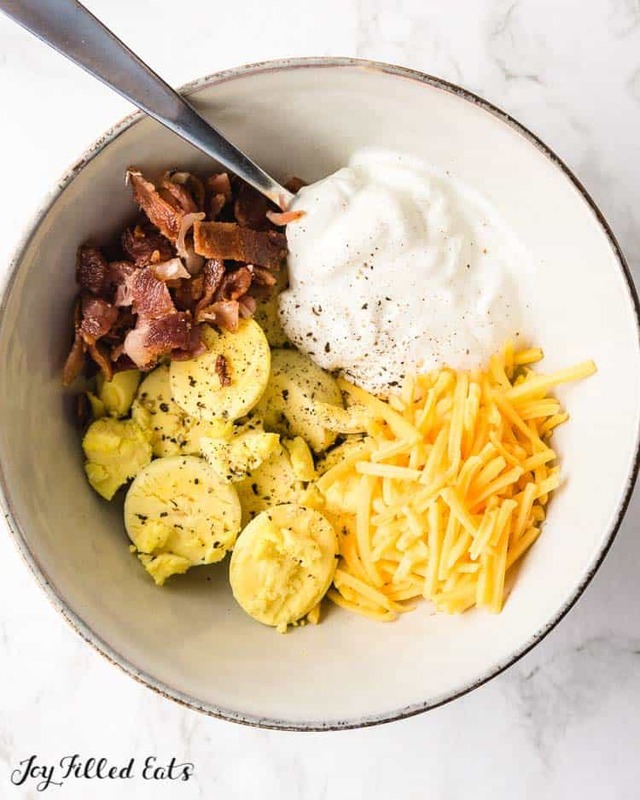 For this recipe, I took inspiration from loaded potato skins — and combined those classed ingredients with deviled eggs. 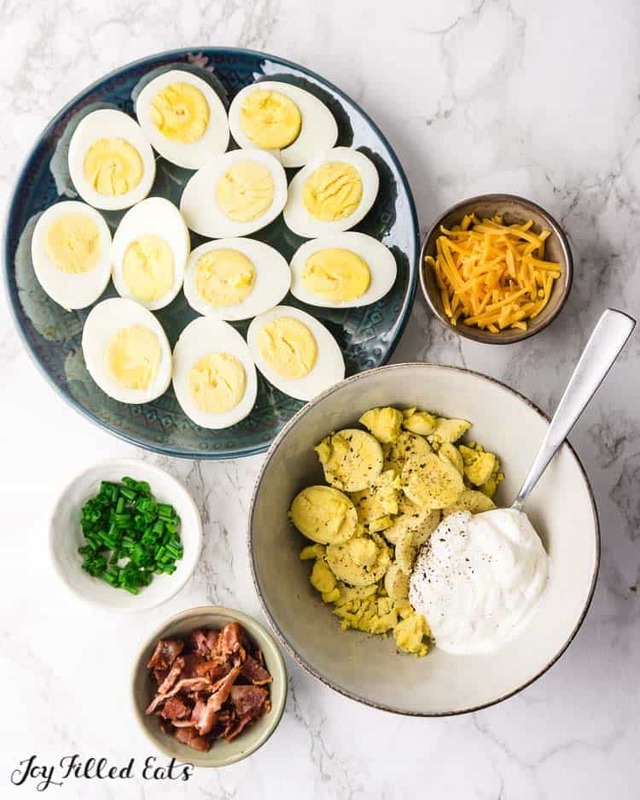 This recipe for loaded deviled eggs requires only a handful of ingredients and takes almost no time at all to prepare. This recipe starts off with, you guessed it, hard-boiled eggs. Eggs are a healthy part of a low-carb diet. Eggs are loaded with nutrients, vitamins, minerals, protein, and healthy fats. The fat and protein in eggs will help you feel fuller longer, making it easier for you to resist sugary snacks. What else goes into Loaded Deviled Eggs? I like to make a dressing with sour cream, Dijon mustard, salt, and pepper. I add savory cheddar cheese, crisp salty bacon, and fresh chives to top it all off. Over the years, I’ve tried so many ways to hard-boil eggs. I’ve tried starting eggs in cold water, starting eggs in boiling water, adding vinegar to the pot, even piercing the eggshells with a pin. But my favorite way to hard-boil eggs — hands down — is in my Instant Pot. 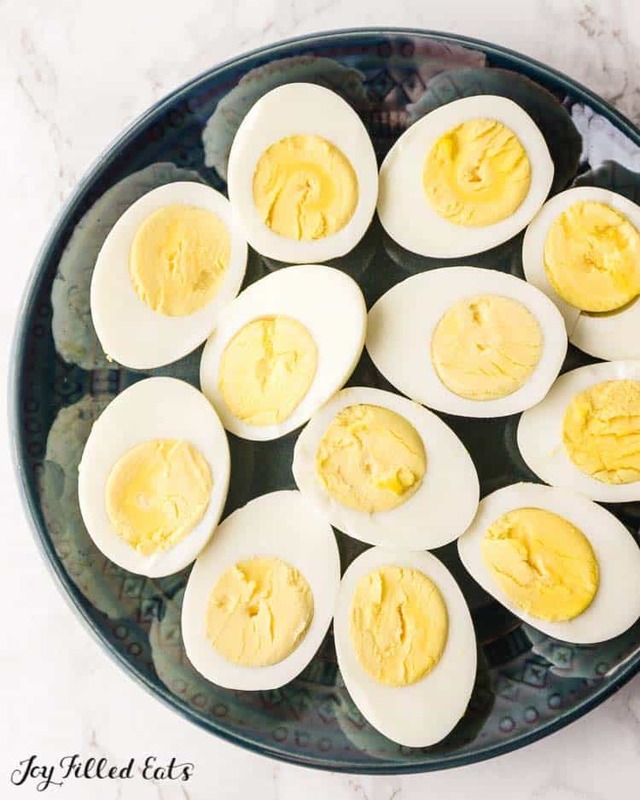 If you have an Instant Pot and want to learn the method for perfect hard-boiled eggs, check out this post: Instant Pot Boiled Eggs. You’ll get easy-to-peel eggs with tender whites and creamy yolks, every time. You can also make great, easy-to-peel, hard-boiled eggs on the stove. I like to use the hot-start method to make stovetop hard-boiled eggs. To do this, you’ll first bring a large pot of water up to a rolling boil on high heat. Then, once the water is boiling, add the eggs. I like to do this with tongs or a slotted spoon to avoid any splashing water. Simmer the eggs for 12 minutes, and after they have cooked, take the pot off the heat and immediately transfer the eggs to an ice bath. And there you go — peel the eggs and you’re ready to start making Loaded Deviled Eggs. A small spoon works quite well to scoop the egg yolk filling into the white. I’ve also seen success using a small cookie scoop to fill the whites. For party perfect results, you can also use a piping bag to pipe the filling into the egg whites. You don’t even need a real piping bag — just scoop the filling into a zip-top plastic bag, squeeze the filling into a corner, and snip off the corner of the bag. It’s a lot easier to do than it may seem and less messy! If you like eggs, you’ll love these recipes. 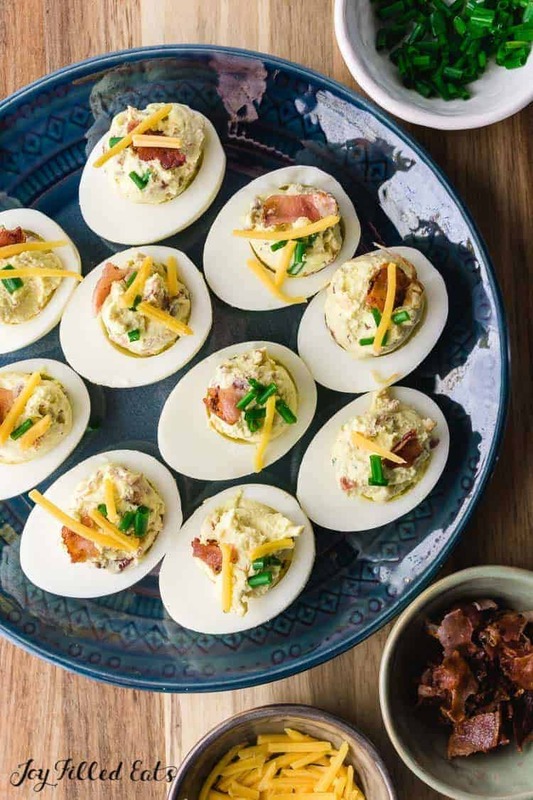 If you are making these Keto Deviled Eggs for a party appetizer, you might be wondering if you can make them ahead of time and if they can stay safely stored in your refrigerator. 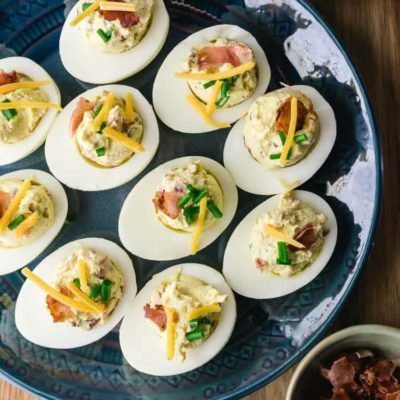 Well, you’re in luck — you can make these deviled eggs up to 1-2 days in advance and store them in a sealed container until you are ready to serve them. For best results, I like to keep the whites and the filling separate. I keep the egg yolk filling sealed in a resealable plastic bag, and fill the egg whites when I’m ready to serve them. In addition, unpeeled hard-boiled eggs (still in the shell) can be refrigerated up to one week. Peeled hard-boiled eggs can also be stored in the refrigerator in a sealed container for one week. Here’s an important food safety note: Deviled eggs should only be stored a maximum of 2 hours at room temperature. 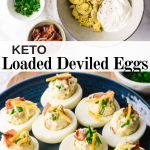 I hope you enjoy these Keto Deviled Eggs with Bacon! Make hard-boiled eggs: Fill a large pot with water and bring to a boil. Carefully place eggs in the hot water. Place the lid on the pot, reduce heat to low, and cook the eggs on a bare simmer for 12 minutes. Remove the eggs to an ice bath and chill for 10-15 minutes. Carefully peel the eggs. Slice the eggs in half lengthwise. Remove egg yolks and place in a mixing bowl. Using a fork, mash the yolks. Add the sour cream, mustard, shredded cheese, bacon, chives, garlic powder, salt, and pepper. Mix well. You may add more sour cream to reach desired smoothness. Taste for seasoning, and add more salt and pepper as needed. Spoon or pipe the yolk mixture into the halved egg whites. Chill and serve. What is the carb content of the deviled eggs? The nutritional information doesn't include carbs. 0. My nutrition table doesn't show a category when the value is 0. Awesome recipe thank you for sharing! If I was making these for snacks throughout the week, how long do you think they would last in the refrigerator if they were in a sealed container? 3-4 days. Glad you like them! These look great, can not wait to make! I love finding new keto recipes. Delicious and nutritious! I highly recommend these for a snack to have on hand or a fun appetizer for any party or gathering! Made these for a holiday party, quite the hit!